Let’s first define a jig: a jig is a lure that is designed to attract fish and get them to bite. The most common jig is a lead headed jig with either a curly tail or minnow attached. That’s where it starts. But a jig is also a spinner, like a panther martin or mepps which, when pulled sharply upwards causes the blade to spin. This is a great fish attractant and when they’re aggressive the spinner gets absolutely hammered. A jig is also a spoon. The thin wide ones flutter a lot, the narrow thicker ones don’t. Both are useful. Flies, wireworms and even plugs can all be considered jigs. Every last presentation can be jigged below an ice fishing hole and every last one of them has caught fish. 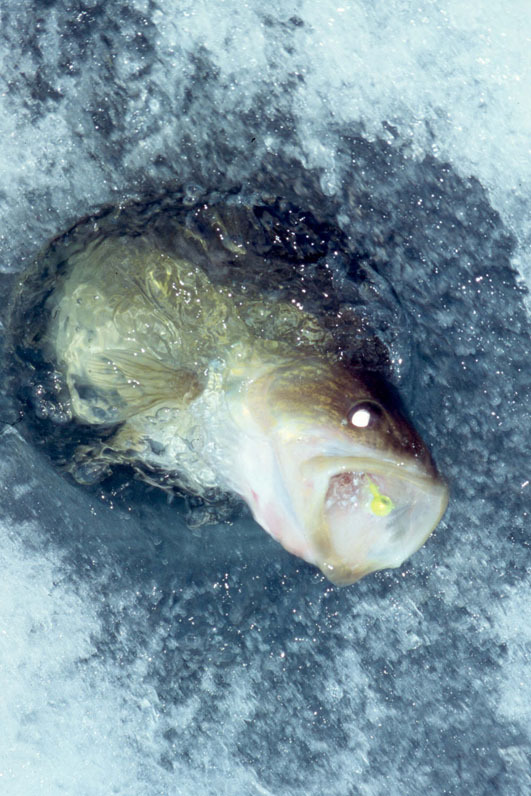 When it comes to jigging, it’s all got to do with the fish’s activity level. Aggressive fish calls for aggressive presentations. Negative fish calls for finesse. How do you or I find out how the fish are feeling? The answer is trial and error. 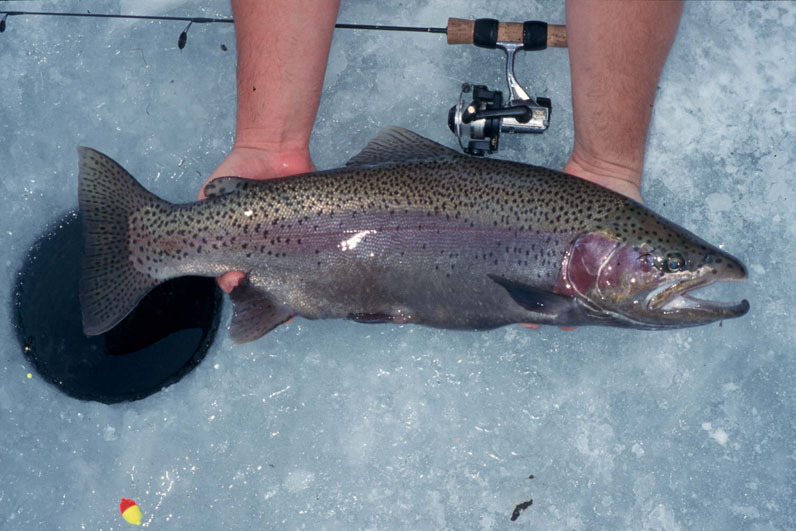 Typically fish feed more aggressively the longer stable weather holds on. Say it’s cool out, but sunny and clear and it stays that way for five or six days. The fish will feed more aggressively each progressive sunny and clear day. I have also found the prime morning and evening bite will become stronger during these times. As unsettled weather approaches the fish will often go on a short, but intense feeding binge and then they shut it down as the unsettled weather socks in. My standard ice fishing jig approach is to start the day with an aggressive jigging presentation to quickly catch active, hungry fish. I like dropping down a flashy jig and working it rapidly for a spell to attract fish and then I’ll pause it to allow time for an interested fish to bite. This has caught a lot of fish quick. 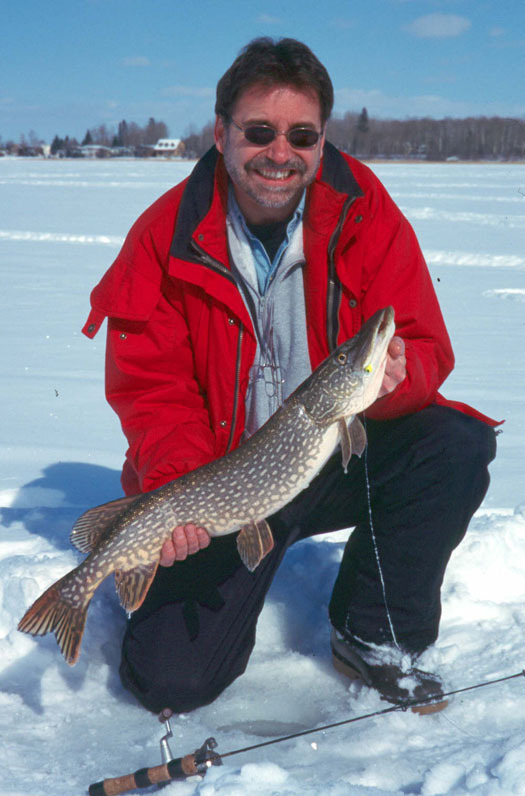 The aggressive bite rarely lasts, but it’s a great starter when fishing a new area. If I don’t get a bite right off the hop, I’ll switch up and slow things down. 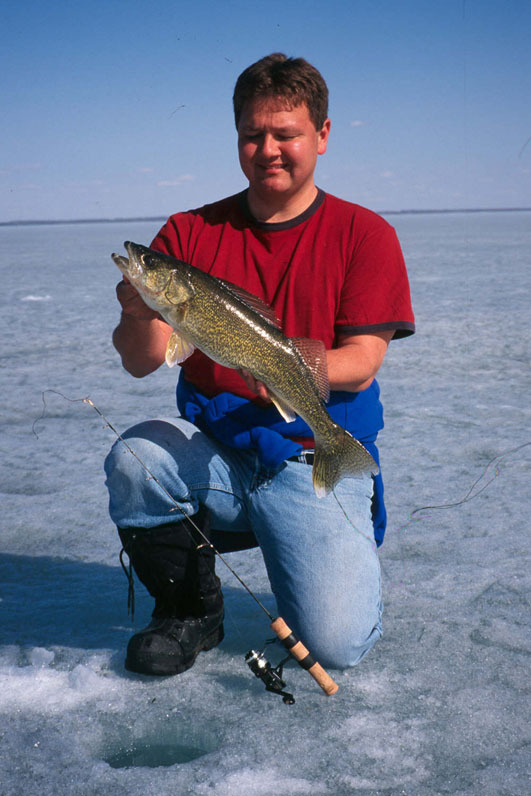 For walleye and pike, I might switch to a jigging spoon tipped with a minnow. I’ll jiggle the spoon to emit some flash, then hold it perfectly still for up to ten seconds waiting for the bite. If you haven’t tried this, give it a shot. You’ll surprise yourself at how many fish will pick up the spoon and minnow when it’s dead still. For trout and whitefish I might switch over to a bead head nymph, a wireworm or a smaller jig tipped with a few maggots. All would be worked slowly, incorporating a lot of pauses to allow for the bite. Usually the slow presentation will get fish to bite but sometimes that even fails. If I still like the area, I may put a setline down with bait. Because we’re allowed to fish with two lines while ice fishing in my home province of Alberta, I’ll continue to try jigging other areas with my second line. This allows me the best of both worlds. I can rest assured that if the fishing picks up even a little, the set line will go off, but I’ve also given myself the mobility of moving from hole to hole jigging, which may help me find active fish and a consistent bite. Just when I figured I knew everything about jigging, along came my buddy Aaron Torrington. 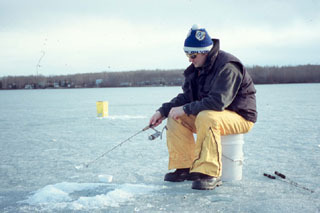 He asked, “You ever try jigging a Rapala plug through the ice for trout?” “No” was my answer. He went on, “We tried this out for the first time at this rainbow lake and we got hit hard so many times, that in the space of a day, we broke off six plugs to huge trout.” That’s all the convincing I needed. I now jig plugs and believe me; they have a nasty habit of getting hit by the biggest, baddest trout. The hardest thing about plugs though is that they have two treble hooks on them, which is great for hooking trout on the strike, but it becomes a hazard as they struggle right below the ice fishing hole. Sometimes a free hook point catches the edge of the ice and snap, the end. I haven’t given bigger plugs a go for walleye and pike yet, but that will certainly be corrected this winter. Given the success with trout, I’m confident that this new approach will do a number on the walleye and pike population. They won’t know what hit them…but we will.